History co-teacher Chris Cordonier shares his story of becoming an educator. 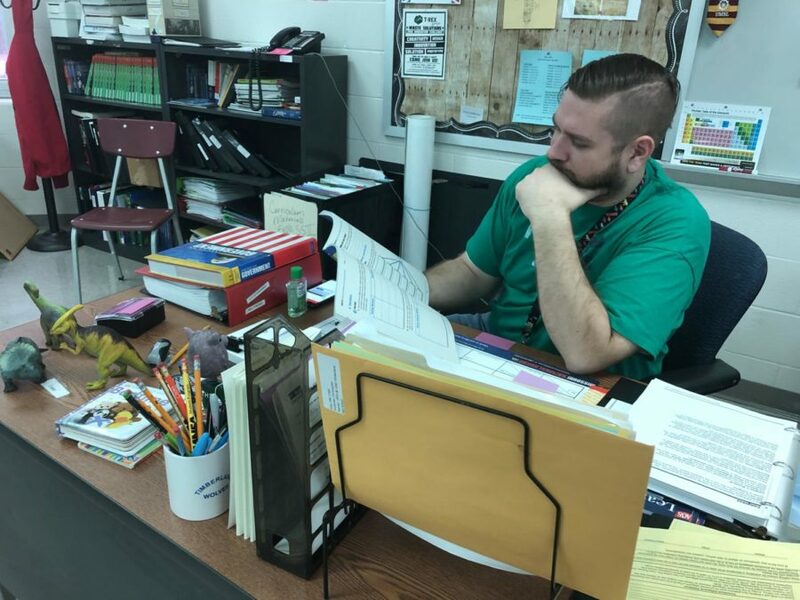 Teacher Chris Codonier at his desk in his classroom on the second floor of THS. Co-history teacher Christopher Cordonier, gets to be a mentor, a friend and teacher, but this did not just happen. Many people have helped him become who he is. One of them is his band teacher in high school Gary Brandas. Cordonier went to college at the University of Missouri- St. Louis. Now, he is at Timberland teaching and helping students learn and be closer to his family. Cordonier said he is very happy to be teaching. His favorite part of teaching is seeing the student grow, and when they thank him, it makes him extremely happy. ¨He is a good guy with great skills,¨ history teacher Jeff Maupin said. Cordonier’s short term goal is to get his master degree and long-term goal is to get more hobbies. He also said he wants to raise his boys and to be a good husband and father. ¨I think he is a great addition to our school and dedicated to his students,¨ teacher Heather Pruitt said. Students, the environment where he works and coworkers are what Cordonier said keep him motivated to keep teaching. ¨Self-doubt always would creep around when I would face obstacles. The trick that I discovered that would help me would be to just try and work through my fear by doing the thing that I was afraid to do. When I wanted to become a teacher, it was a big step, and I was scared. Challenge yourself,¨ Cordonier said.